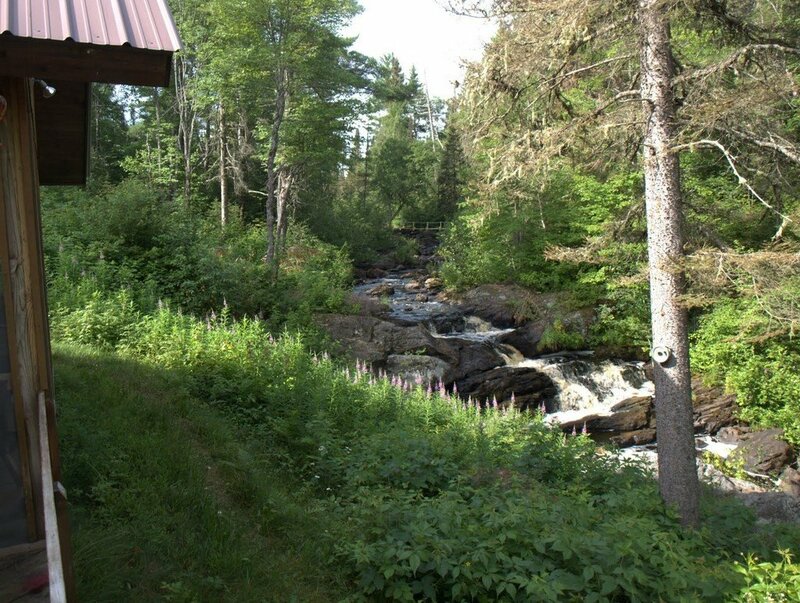 TIOGA FALLS CABIN (Michigamme) Pets are Welcomed, 80 acres, Hunting on property, Waterfalls at your doorstep, excellent fishing! The only place with soul, private access to THE true Tioga Falls! 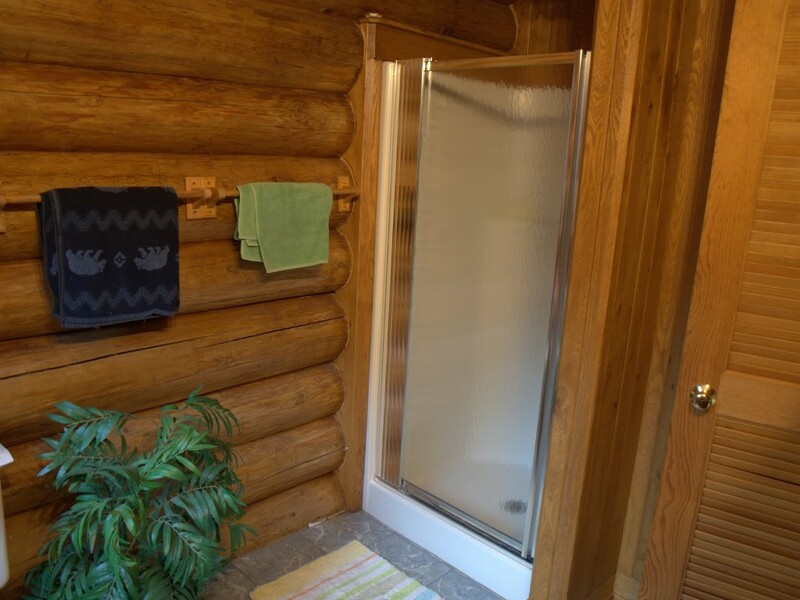 *VERY SECLUDED - "off the grid"
Please keep in mind that the Tioga Falls Cabin/secluded 80 acres experience is not ideal in consideration of the average city person's level of comfort. EVERYONE in your group must be avid, authentic,outdoor-loving people. This is a technology-FREE vacation. Cell phones don't work well at all. It's not for everyone, yet absolutely IDEAL for the right people. In this environment, one unhappy or non-outdoorsy person in the group has a direct, negative impact on everyone traveling together in this secluded space. Sitting on the fully screened-in porch watching and listening to the soothing waterfalls below as you enjoy the amenities from home, feels as though you are truly in the heart of a wilderness oasis. Fish for trout to your heart's content. Canoe down the river. Melt into your vacation within the 80 wooded acres surrounding the cabin and take this opportunity to truly get away from it all. 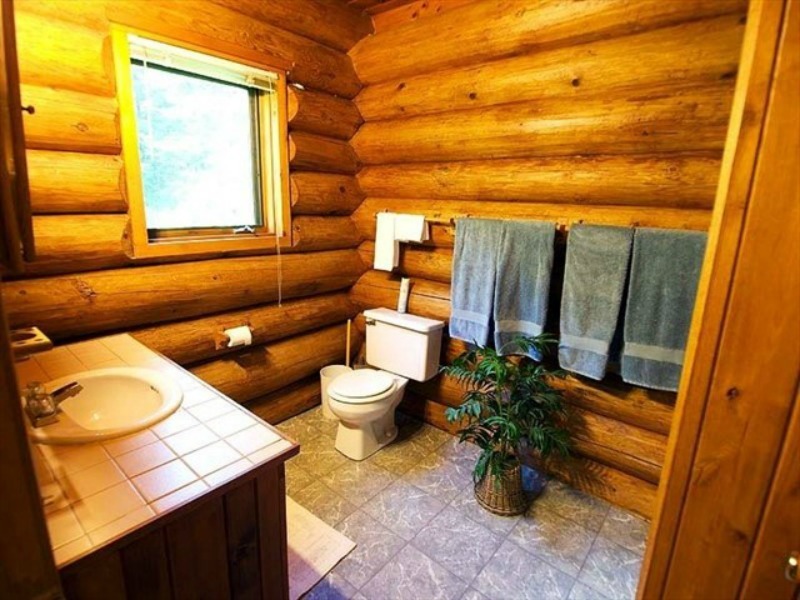 Drive the 2 mile 2-track trail from the main road into this peaceful log cabin. Ideally, it is best to bring a truck, though with good, careful driving, a regular car can make it down the 2 mile-2 track. Still, you will probably bottom-out at least once, and it is hard to avoid the tree branches close to your car. 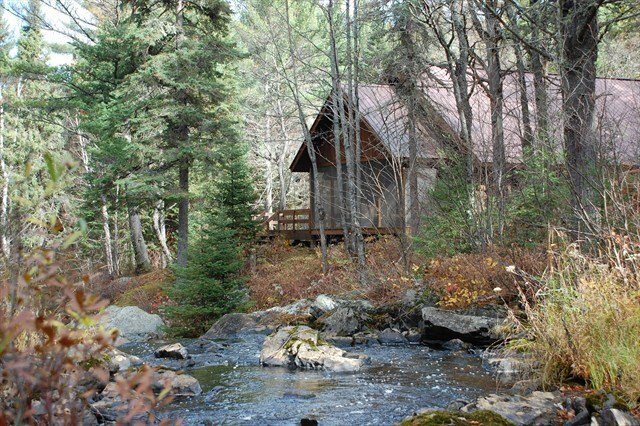 When you are at the Tioga Falls Cabin, it's so refreshing to wade in the water, hike around the property, fish and read a good book. 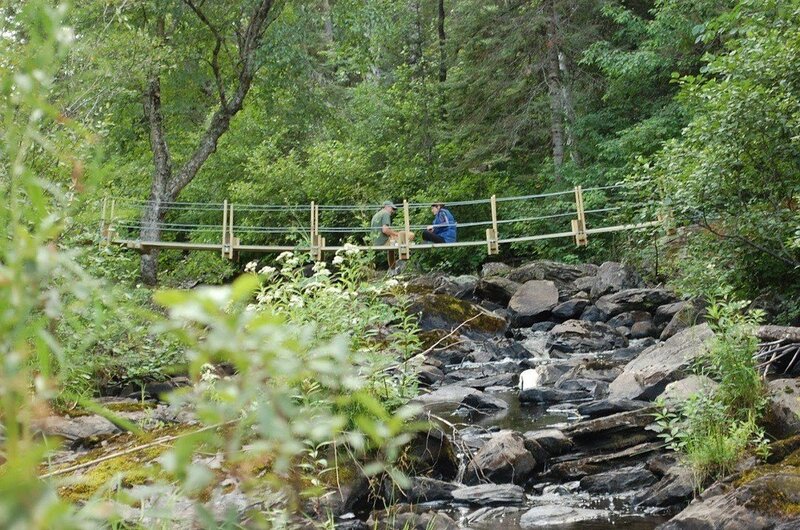 Perfect for the family vacation if the whole family is agile, adventurous and relishing exploring nature. 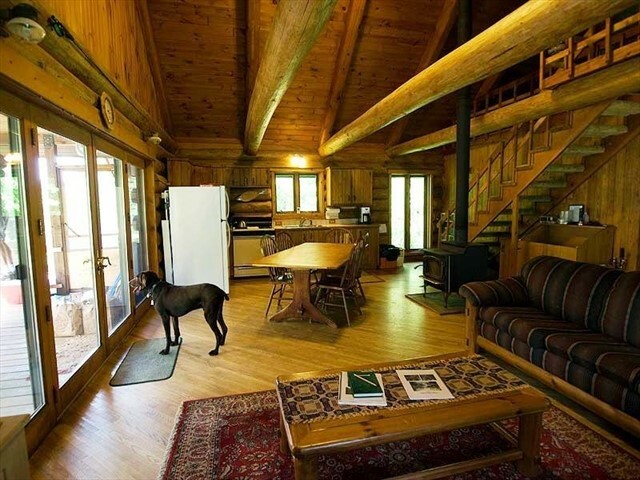 This cabin is perfect for up to 6 adult friends and will be remembered by all. Or it can be the romantic retreat for two (if BOTH people enjoy the outdoors.) It isn't ideal for families with young children, or multiple couples traveling together, as there is only one bedroom with a door. Families with children who love nature, and can entertain themselves without electronic devices will absolutely love it! It is wonderful to fall asleep to the gentle sound of water falls right outside of the screened in porch. 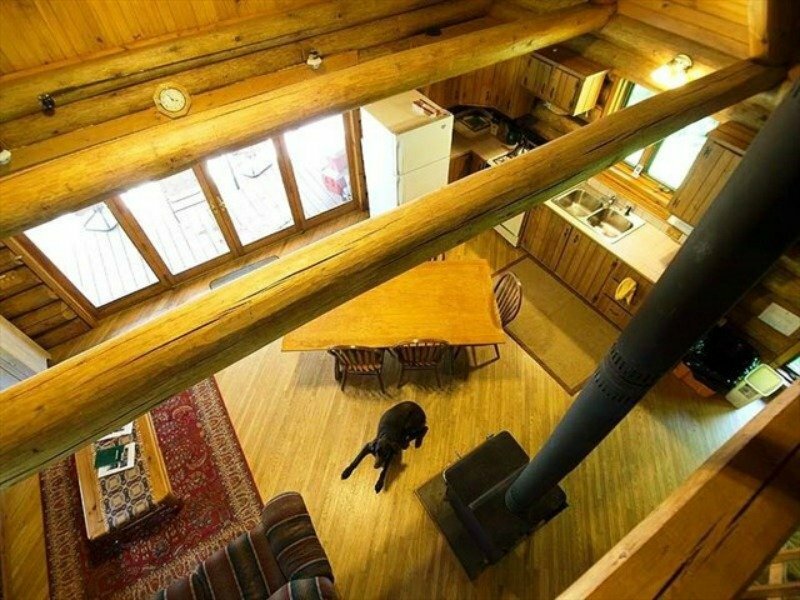 Your nature-loving family will love this unique, full custom log (not a kit) home to call home for a week and beg to return again. Perfect privacy and deep relaxation await. Keep in mind that being deep in the woods requires you to be comfortable with nature. Yes, bugs do exist in the woods. Yes, when you open the door in the evening, bugs may get into the cabin. You have to be very conscious of your environment, even though this beautiful cabin has many of the amenities from home. Here you can escape from technology, though some cell phones do work, if you must turn them on. No TV or Internet-- just connecting with nature. Keep in mind that being at a place this secluded brings out everyone in the group's idiosyncrasies. In our personal experience, if even one person isn't a true, adventurous nature-lover, then that energy WILL negatively effect the whole group & your experience. Experiencing the Fall colors at Tioga Falls is incredible. Imagine being surrounded by 80 acres of unique colors. Many photography opportunities are possible. In the Fall, feel free to cozy up to the wood stove with the provided wood. Even though the refrigerator and generator use propane, the cabin is heated by the wood-burning stove, as needed. ATV: Yes, you are welcome to bring your ATVs. There is plenty of room to park and turn around your trailer as well. Keep in mind that while there are hundreds of miles of trails, while most of the trails are not groomed. Bathroom: The bathroom is a very comfortable size with a standard toilet, vanity/sink and a shower. There is NOT a bathtub at the Tioga Falls Cabin. Please bring your own soap and shampoo. At times, we do have these supplies, yet we do not inventory them weekly. Boats: Are boats provided? Yes, we normally have 2 canoes awaiting you on the rivers. One on the Tioga River and another on the Sturgeon River. Bugs: Yes, there are plenty of bugs in the wilderness, surrounding the waterfalls and on the 80 private acres. 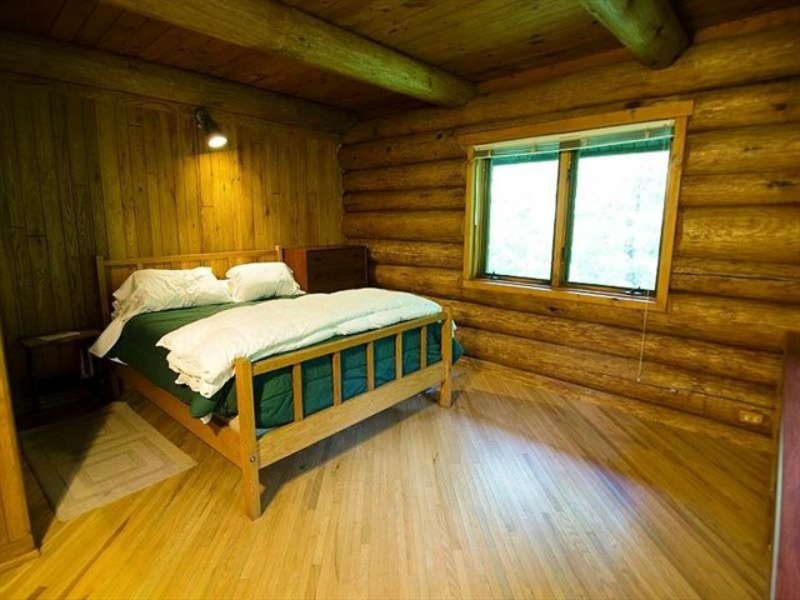 If doors are left open, even for short periods of time at the cabin, then bugs/flies/mosquitos love to sneak in. We do not spray for bugs, as with the natural landscape, along comes bugs. Depending on our level of rainfall, mosquitos can be plentiful. Bug spray is highly recommended. Hence, we love the screened in patio porch. 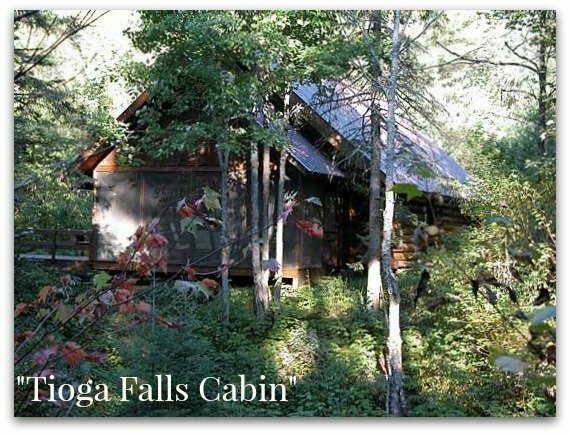 If you are at all concerned about bugs, critters or small animals, the Tioga Falls Cabin may be too much of a challenge. It is important to us that all of our guests have a positive experience. Campfires and Fireworks: Please keep your campfires in the provided ring away from the cabin. Plus, we do not allow fireworks at the Tioga Falls Cabin. Cell phone service: Cell phone service is generally unreliable in the Upper Peninsula when you travel outside of Marquette and Escanaba. While it has improved over the years, it still varies by your provider and actually cell phone. Please give your family the office contact number (734) 284-5677 and we can always send someone out if you needed to be reached. Critters: Even though we deep clean the cabin between each stay, at various times, especially after heavy rains, mice do get into the cabin. 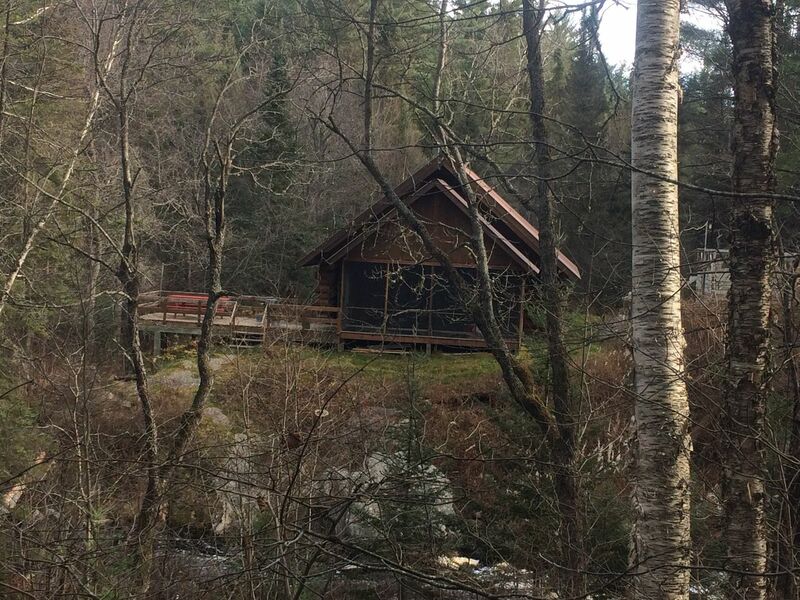 The Tioga Falls Cabin is in the middle of 80 private acres along the water. 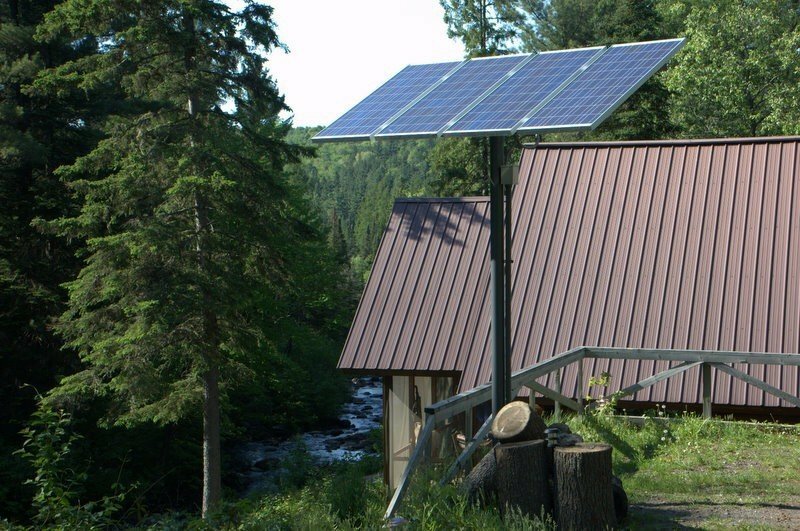 Energy: Since the Tioga Falls Cabin is powered by solar (with a generator back-up that we try to keep the use at a minimum), we have to be sensitive to the electrical use. Therefore, there is NOT a TV or microwave. We ask that you please limit the use of your hair blow dyer as it may drain the power enough to inhibit the well from working properly. There are no power lines to look at anywhere you turn. 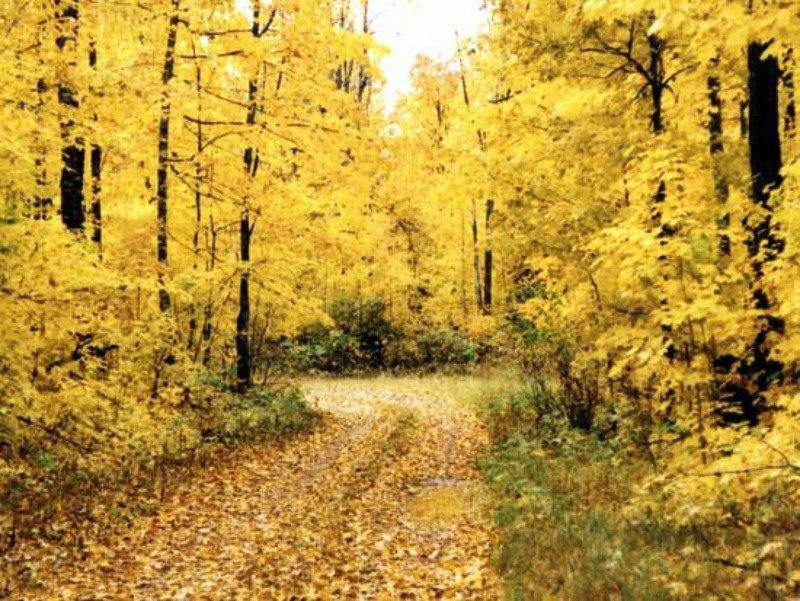 Fall Colors: Generally, the peak time period to see the colors is between mid-September through mid-October. 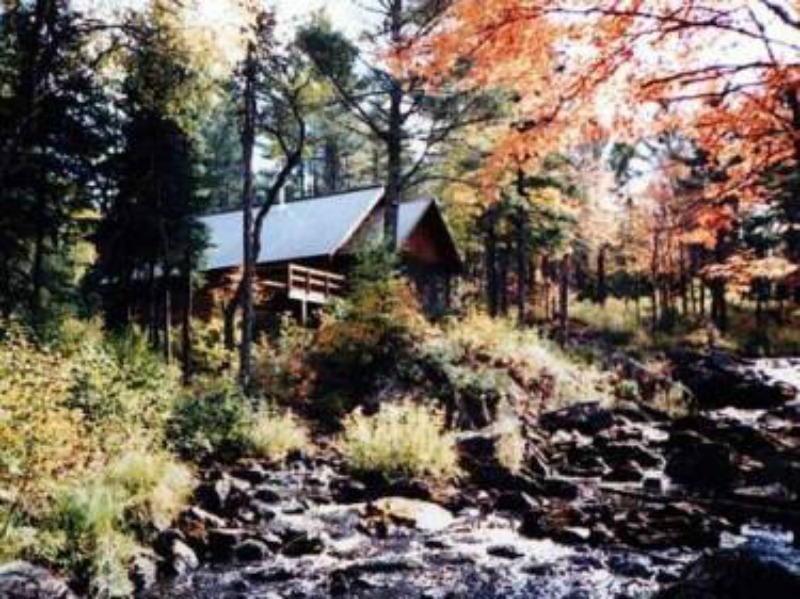 Fishing: There is primarily brook and brown trout in the Tioga and Sturgeon Rivers which surround the Tioga Falls Cabin. 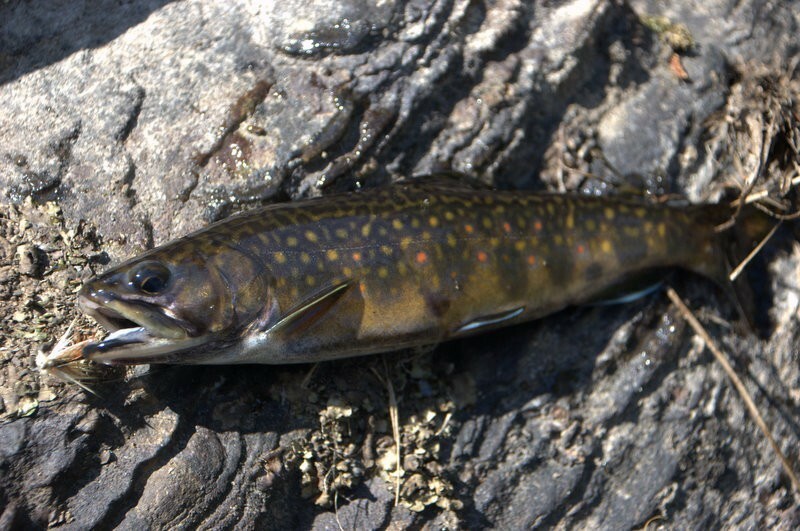 It is best to use worms, small trout flies or small spinners as bait. Heat: The wood Stove is the only source of heat at the cabin. To date, it has provided plenty of heat for our guests. Kitchen Supplies: We have many basic kitchen supplies at the cabin. If there is something that you can't live without, I strongly advise you to bring it. We do have a coffee pot, toaster, refrigerator, stove/oven. There is a cast-iron skillet, though keep in mind that the skillet is is washed differently than standard dishes. There is NOT a dishwasher. We normally have dish soap on hand for your use. 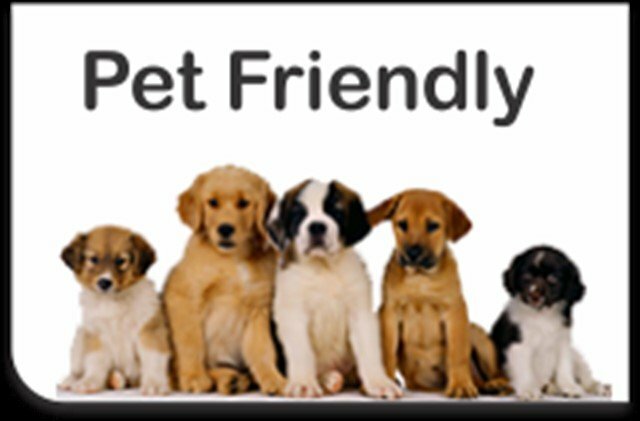 Propane Refrigerator: Keep in mind that the refrigerator may be a little smaller than most of us have in the city Also, with a propane refrigerator, you don't get the blast of cold air coming out, as you do with an electric fridge most of us have at home. Stove/Oven: 4 burners, yet probably a bit smaller than most of us have a home. Land: There is not a lot of cleared or flattened land around the property. We have a small space around the fire pit. The most clear and leveled land is in the parking area, at the entrance of the cabin, where there is a dirt/gravel parking area. Linens/towels: We do provide the linens for the beds, which are fully made upon your arrival. Also, we provide basic towels. Please bring your own linens if you are particular about the thread count or are bringing a dog who sleeps with you. We provid basic bathroom and kitchen towels as well. Paper products: We do our best to make sure there is plenty of toilet paper and paper towels during your stay. Shopping: Where is the nearest grocery store? The nearest grocery store is about 1/2 hour north, in LÁnse. Trails: Yes, there are trails surrounding the cabin and the 80 private acres, yet they are not groomed, nor regularly maintained. It is a rugged adventure. 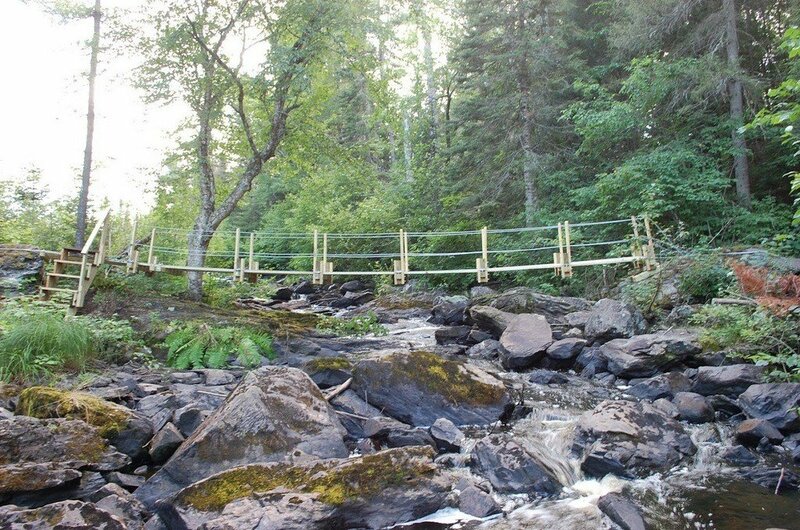 The walking trail to the Sturgeon River is not straightforward, nor does it have a perfect walkway. You do need to have decent mobility skills to maneuver around the 80 acres comfortably. 2 mile Two-Track Entry: Depending on the weather, the 2-track can get quite rough.The 2 mile two-track is never predictable. You'd have to be prepared for a possible adventure. It's not your average cottage experience. You may have to travel the 2 miles at a snails pace, getting out to move a branch of a tree if needed. We have care-takers who drive in and out of the cabin on a regular basis in a regular car, yet we have also seen a storm come through before guests arrive and there are limbs that had to be moved as they drive in. We try our best to keep the road as functional as possible. The road has only been actually impossible in the winter. We are maintaining the road on a regular basis, yet in 2 miles of wilderness, sometimes it's a breeze to get in and sometimes it's a challenge. Waterfalls: The falls are right outside the screened in porch. Still, the terrain isn't simple for a child or a non-agile adult to navigate. Still, if you are truly adventurous, you will love it! I can attest to the fact that it is tons of fun, and the beating of the falls on your back is a fantastic "natural spa" experience. Water shoes are essential. Wood Stove: Yes, there is a wood stove at the cabin. It is the only source of heat at the cabin. Guests have always talked about how toasty they feel with the wood burning stove. Plus, we provide the wood! Wanted a place that was like being alone in the wilderness...with creature comforts of great views, heat, hot shower, stove, refrigerator, great beds. Found it and then some. Getting to the cabin is rather easy just take dirt two track off of main road, 15 minutes later on the two track and arrived at the cabin. Opened it up while my wife stayed in the truck and after checking for any visitors (none were found) went back to the truck and announced she was really going to like it. That was an understatement. Cabin was clean, wood stove heated up the cabin rather quickly and the waterfalls were amazing. the river is pretty much in flood condition and the falls were breathtaking....and viewed right from the deck. Went out and found two male moose on the two track. Amazing sight that one has to see to appreciate the size of these magnificent animals. Next day decided to check on a couple of waterfalls in the area. 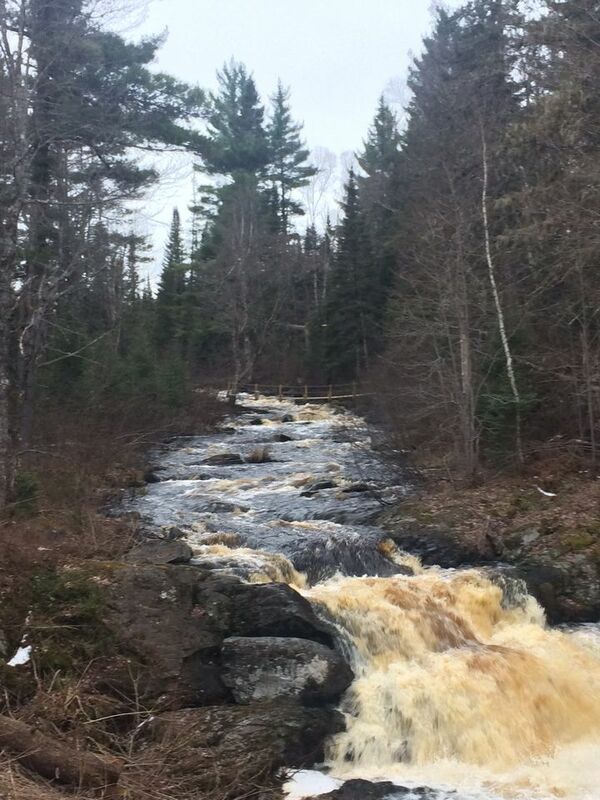 Bond Falls is highly recommended, short drive from Bond Falls is Agate Falls which is worth seeing since it is so close to Bond. No TV or Cell service which was perfect for reading at night with the roar of the waterfalls right outside. L'Anse is great little city to check out. Marc, what a great review - thank you! I love the image of you checking for any "visitors" - too funny. 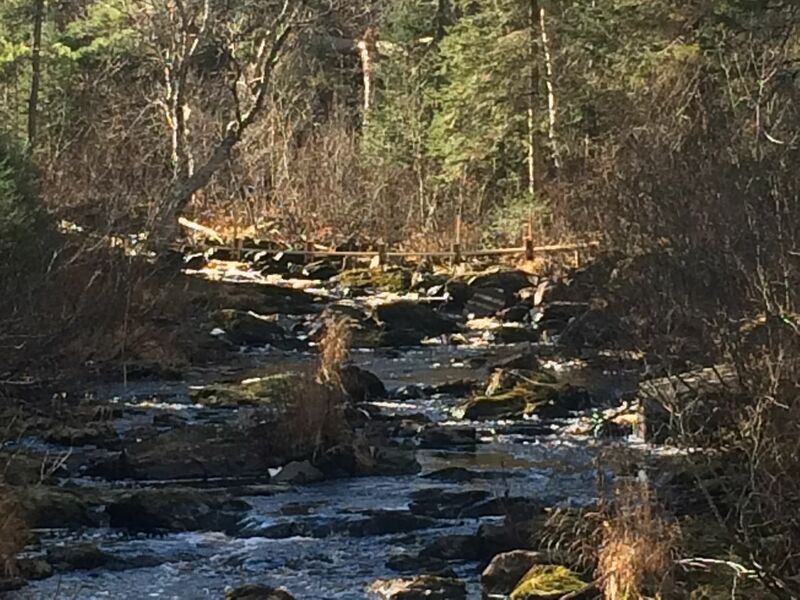 The falls are so magical, and then the fact that you saw moose just adds to that magic. 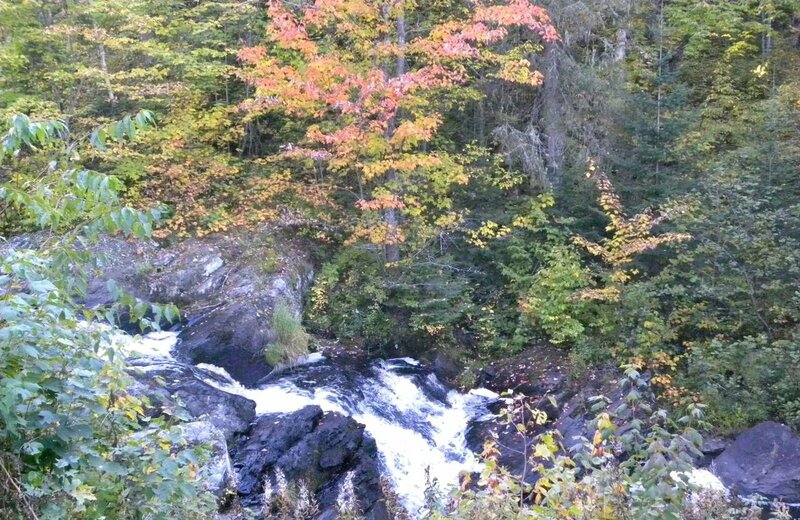 Being at Tioga Falls Cabin in the fall is as good as it gets - the colors, the natural wonders, no TV or cell service, plus a wood stove heated cabin completes the picture of contentment. We hope to see you again! Cabin was clean, large and beautifully built. Everything we needed and more. But the setting was the real star. As gals from the UP, we are tough to impress. We were surprised and totally captivated by the falls,river and forest beauty. We would definitely return. PS. A sauna would make this heaven. Mary, what a great review. We love impressing guests who are hard to impress! 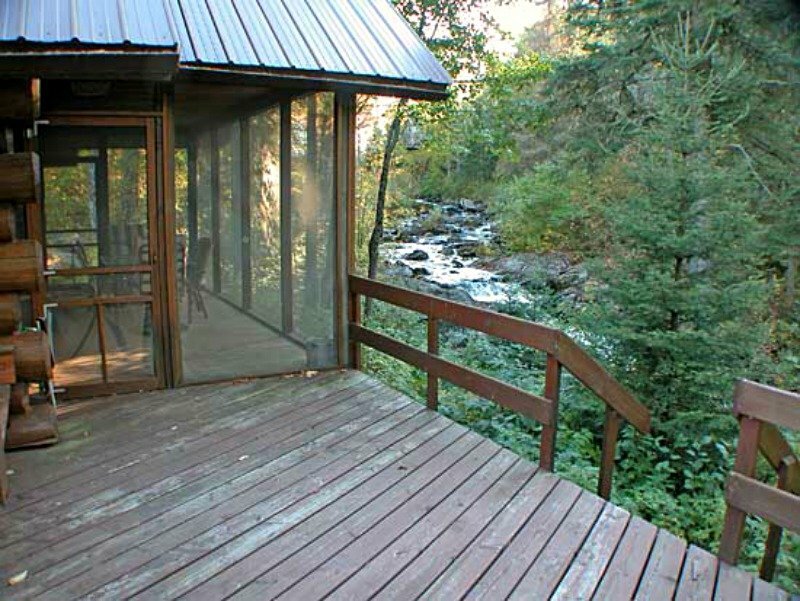 Tioga Falls Cabin is a very special place - both interior and exterior! And we agree, a sauna at any of our properties would be great!!! We hope you come back again. Excellent stay in an awesome spot. Wish we would have spent more time exploring right around the cabin. Tj & Kristen, we are so happy that you enjoyed staying at Tioga Falls Cabin, and we hop you come back again to do more exploring! Stunning setting with falls outside the door. Beautiful cabin. Amazing Property right on the waterfalls! We loved our stay here, wish we could have stayed longer! The grounds are beautiful, nothing around. The sound of the waterfalls was the best. We did a lot of hiking, found the canoes and canoed a little bit. Walked the 2 miles to the road and picked 3 bags of blueberries that were so good. 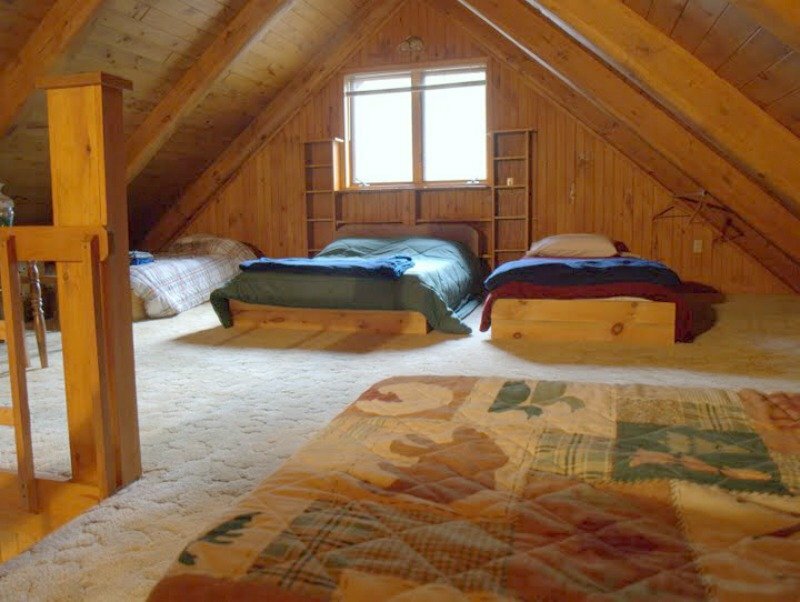 There were 5 beds in the loft so plenty of room for our 3 kids. Kitchen had all the necessities, nice bathroom and big bedroom on 1st floor. My favorite was the screened porch. We rode the mountain bikes and found all the fishing equipment- there is nothing you need to bring to fish. Would strongly recommend and would love to return! Erin, thanks for a great review! We love when our guests really utilize everything a property has to offer, and it sounds like you did. The wild blueberries have been quite something up there this year. We'd love to see you again. Christine, thank you for this wonderful review. You pretty much covered everything! 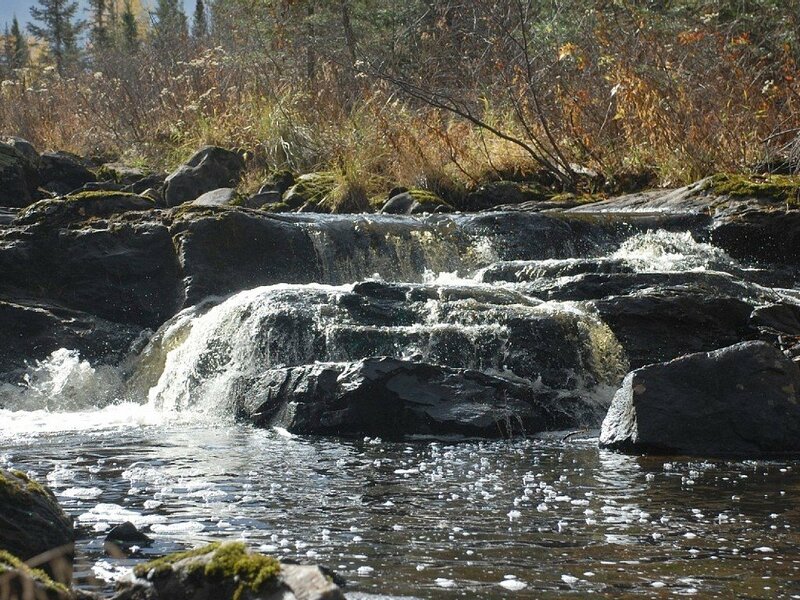 Tioga Falls is a world unto its own - the perfect place to kick back and relax. Plus where else can you pick wild berries while walking down a lane? We loved our stay here!!! We were looking for a place to slow it down and spend some time in nature. We turned off the cellphones for a week (OK, we did check them every night just to make sure the rest of the world was still there--pretty good Verizon service at the end of the driveway, which was a perfect excuse for a nature viewing drive at the end of every night). Oh yeah--the driveway is incredible!!! 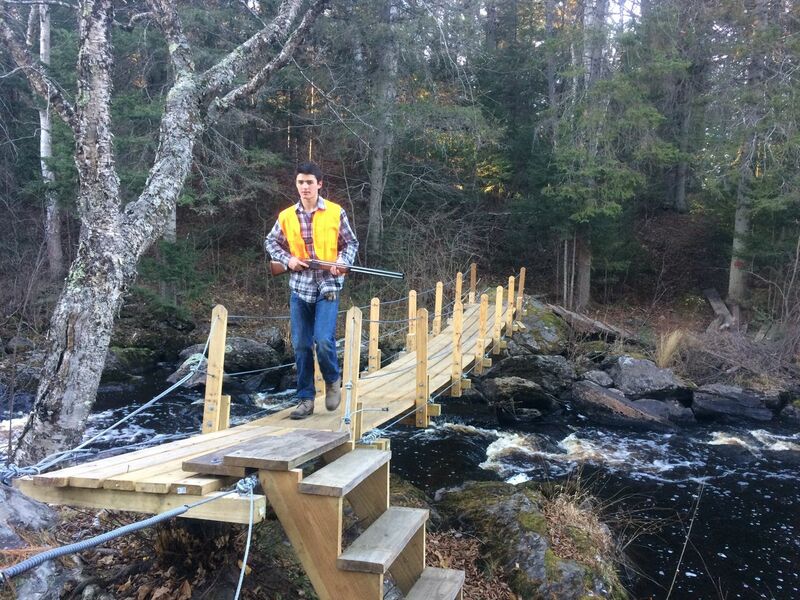 It's like your own little nature walk--easy to traverse, you get marshes, shrubs, wet meadows, forest. We saw Sandhill Cranes every single day, just walking down the driveway, and the quiet is such that you can hear their calls for miles. We also saw moose and wolf footprints, and picked wild blueberries and raspberries galore, all from the driveway. And I haven't even mentioned the screen-in porch or the waterfall, which are the property's best features. Great canoeing and swimming, if you're up for a little adventure. Would totally recommend this place for anyone looking to get away in nature (with a comfortable bed, a nice shower, and a fully operational kitchen, dining room table, etc. All the comforts of home). We loved it! Christine, thank you for this fabulous review. Reading it feels like one is right there. Sandhill cranes are so regal. And the bluberries and raspberries - yummm! 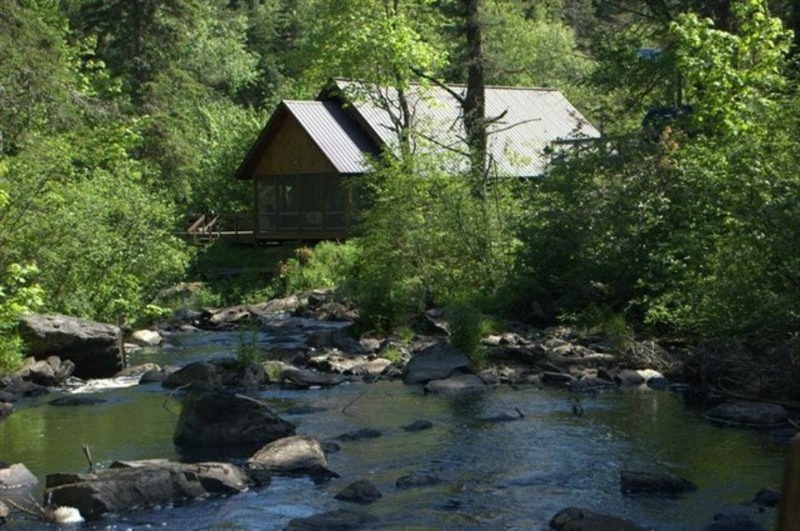 Tioga Falls Cabin is the perfect place to get back to nature and yet have creature comforts. Wow , was great. Property clean, comfortable. Nice details, books , board games,and that waterfall. Did hiking, located the canoes, did some fishing, just enjoyed the outdoors. Relaxing in the cool evening on the screened in porch, listening to the waterfall. Look forward to going back. Vitervo, being in nature is so good for us, and especially when you have that waterfall right next to you. Perfection. We look forward to you coming back! Amy, we are so glad that Tioga Falls felt like heaven to you, and especially happy to hear that you will be coming back!